Preheat oven to 180°C. Brush the lamb with 1 tbsp basil pesto. Put the potatoes, capsicums and zucchinis into a roasting dish. Combine the oil and remaining pesto and drizzle over vegetables. Place an ovenproof rack in the roasting dish directly over the vegetables. Place the lamb on the rack and tuck garlic bulbs in the roasting dish. Roast the lamb for 40-50 minutes for rare, 50-60 minutes for medium, 60-70 minutes for well done.Remove lamb, cover loosely and allow it to rest for 15 minutes. Remove capsicums, zucchinis and garlic to serving platter, cover loosely to keep warm. Raise the oven temperature to 200°C and return the potatoes to the oven to brown while the lamb rests. Serve the lamb with the roasted vegetables and a salad. 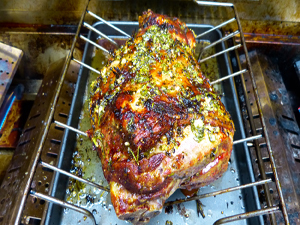 This basting recipe is for a whole lamb on the spit, and is perfect for a boned leg of lamb on the rotisserie, but can be used in smaller proportions for basting any cut of lamb on the BBQ. Once lamb is on spit, paint the basting on continually while cooking 4 - 5 hours. You can put extra cloves of garlic in lamb, if you like it really garlicy, otherwise the basting on its own gives it a really nice, not overly strong, garlic taste.Please don’t try to put an entire lamb on your BBQ rotisserie! All meat or poultry being cooked by rotisserie should be roughly the length of the back burner – for obvious reasons. Mix together the garlic, olive oil, cumin seeds and brown sugar. Marinate the lamb for 20 mins. Cut the pumpkin into thin slices (approx. 1cm), brush with a little olive and bake in the oven on 180 for approx. 20 minutes or until cooked. Pre heat bbq and cook lamb to your liking. Allow the lamb to rest for 5-10 minutes and then slice whilst still warm. Place spinach on the plate, top with warm pumpkin and lamb and serve with dressing.